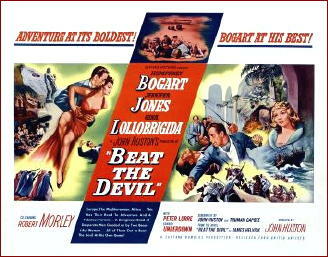 » A Movie Review by Dan Stumpf: BEAT THE DEVIL (1954). A Movie Review by Dan Stumpf: BEAT THE DEVIL (1954). BEAT THE DEVIL. United Artists, 1954. Humphrey Bogart, Jennifer Jones, Gina Lollobrigida, Robert Morley, Peter Lorre, Edward Underdown, Ivor Barnard. Screenplay by Truman Capote and John Huston, based on the novel by James Helvick. Director: John Huston. A legendary mess. Scripted by Truman Capote, directed by John Huston, with a great cast that includes Humphrey Bogart, Jennifer Jones, Peter Lorre, Gina Lollobrigida and Robert Morley, and it’s still a dreadful muck-up time has not redeemed; something about a bunch of con men stuck in Italy trying to buy land in Africa, I think, but the plot doesn’t matter because it never really goes anywhere. There are some witty lines, but Huston always seems to be looking the other way when someone says them. Likewise the acting: some good turns by Morley, Lorre and Ivor Barnard as “the Galloping Major” but the characters are never defined well enough for us to be sure what the acting’s all about. Worst of all is Humphrey Bogart. It’s hard for a life-long Bogie-man like me to say it, but he’s dreadful here. Already cancer-stricken at 54, in ill-fitting wigs and gaudy clothes, he looks like an aging queen tarted up for one last night out with the boys. Bogie expressed some doubts about the project at the time, and it shows in his performance; at the heart of Devil we need the relaxed, self-assured leading man of Casablanca and The Big Sleep, but what we get is a nervous icon walking through the movie like an old man trying to cross a busy street. By the way, I’m always fond of reading the source books that notable movies were made from, so I looked up James Helvick’s novel Beat the Devil on the internet. The cheapest copy I found was $200, and if anyone wants to send me a copy, feel free. Always hated and never understood this movie. Even this review made me cringe. Brrr…..
I’m another Bogart fan and I have a book about him where I note the date every time I see one of his movies. 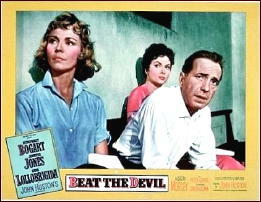 Since the 1960’s I’ve seen BEAT THE DEVIL a half dozen times and enjoyed it alot. Add John Huston directing along with Peter Lorre and Robert Morley and we have a cult movie that I think is a great example of so called camp humor along with elements of satire and parody. Satire and parody of many of the movies that John Huston and Bogart made. Humor is so subjective and what I find amusing or funny, someone else will think boy is that boring or a misfire. This is a movie you either love or hate. This is what happens in lieu of a film when a bunch of drinking buddies get together. Bogie in this one always looks like he misplaced his drink and wishes he could remember where it is before he sobers up enough to remember he’s in this. Jennifer Jones with a British accent. That was a brilliant idea. Still, I sort of like the hopeless mess. Whatever you do don’t spend $200 for the novel though. I’m in heartfelt agreement with Walker Martin. The film is legendary…but it’s giving it short-shrift to label it a mess; or write-it-off as a misfire. If everything had gone right in this movie, only then would it have been forgettable, staid, and pallid. Sure, the entire cast and crew may have been drunk and sunstroke during the production but the results which stem from that are hilarious, ramshackle, dilapidated, and lovable. I saw nothing wrong with the casting –especially of Bogart; his frailty and hang-dog looks added the charm which the otherwise not-very-interesting protagonist desperately needed. If the protag in this flick had been relaxed-and-self-assured the movie would have made no sense and would not have been in any way endearing. Intrigue flicks of the period have a surfeit of confident-relaxed heroes who are ready to get out of their chair in any scene and let fly with a phony movie-punch to keep the plot rolling. Not so with Bogart. In his later career, Bogart *shines* when playing vulnerable, unbalanced, or wobbly characters; and in this movie his shakiness makes the whole thing work. If he had doubts about his role here, he shouldn’t have worried. The movie he SHOULD HAVE had misgivings over was a flick (one which I think actually is his godawful worst): ‘In a Lonely Place’. There, all the criticisms you’re leveling at him here, would be more aptly laid. That is the film where he was too old and too broken-down to convince us he was a sociopath or killer. 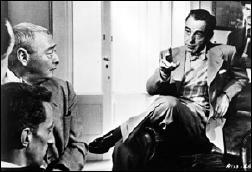 Apparently IALP was a deliberate attempt by Bogart and (director) Ray to ‘comment on’ the genre. Bogart stated that by that time he did hate all the’tough guy’ roles he had been saddled with throughout his career. So: I wonder why Bogart approved of that ruse but not of ‘Devil’ where this grand sardonic gesture of his actually works? Next: the women cast with him–their roles were fun and alluring; I liked the unpredictable romantic arrangements and the not-quite-sure-knowing-who-Bogart-would-end-up-with. And what a startling, casual, and informal role for J. Jones: it must have been fun for her to break with her usual typecasting. Huge treat to see her goofy and giggling. Supporting cast: gems. Who better than Robert Morley to bluster and fidget like that? LOL at them all burying their passports just when the tribe of Berbers rides up! Hilarious! All the goofy Italians shouting and waving their hands–the ship captain in particular–and the hilarious husband of Jones. I can’t fathom how one would not find this funny! You’re right, the plot really doesn’t matter in this–I agree. Its all about the madcap dialog by Capote; the surreal setting and oddball incidents; the whole serio-comic discombobulated concoction shot against some of the blackest shadowy backgrounds I’ve ever seen in a flick. I like how the beginning of the movie doesn’t seem as if any coherent story is even going to emerge; but lo and behold there is a sea journey, a firing squad, a clever escape and just enough linearality to follow without feeling like being ‘reluctantly dragged along’–again, like so many plots-of-that-era do. Not at all a film to skip or dismiss. Its a movie which in some ways deliberately (yes and in some ways accidentally, sure) repeatedly pokes gentle fun at itself, at all the players; and at all the ‘exotic intrigue’ flicks of the era which they were probably all so thoroughly bored of. I love what Huston did here. Thanks for the comment, Feliks — long enough to be a review in itself!